Does anyone know a good source of spares for the Bachmann A4? I've tried Peters Spares, but can't see what I want, and typing in the part number in to google doesn't come up with anything either. I'm after the little coupling that goes between the tender and loco. As far as I can see from the parts sheet the number should be 950-126. 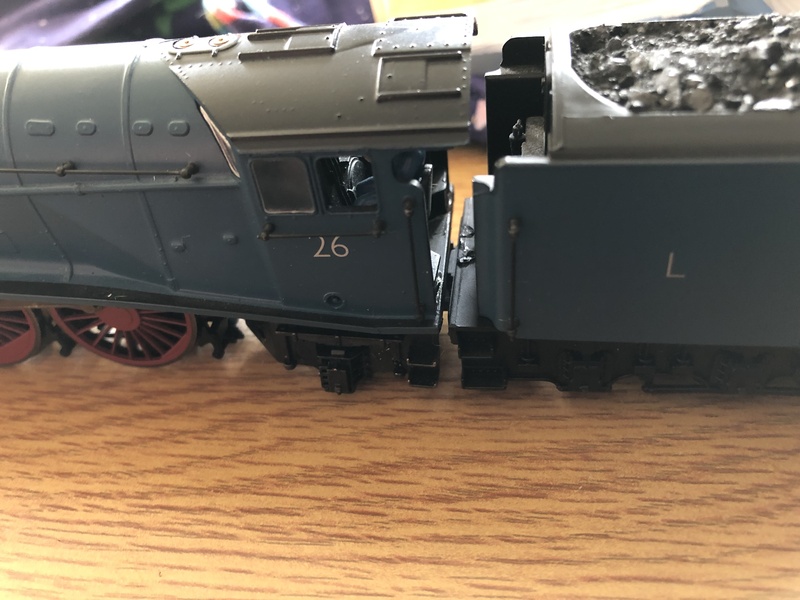 I bought a loco off of ebay and it seems the previous owner has changed the coupling to a shorter one, as it no longer goes around corners. The coupling between loco and tender looks like it might be adjustable by loosening the screw that holds it but if the original part is missing and you cannot get a spare, you might be able to fashion something of identical functionality from a bit of stiff wire or by bending a small paper clip. This is the old split chassis model, and that's exactly how it worked. Slacken the crosshead screw clamping the sliding drawbar and adjust to sufficient spacing for the minimum radius curve, gently tighten and it's all done . It's an obsolete product so spares are going to be hard to come by. I would second the suggestion that if this part is missing, then bending up a replacement from paper clip wire or similar is a cheap and easy fix. Thanks, I think I'll probably end up having to try and make my own then, I'll attach a couple of photos of the coupling and loco. Overall its in nice condition, for what I thought was a fairly decent price, and the loco on it's own runs lovely. Good clear photo. I believe that's a home made substitute for the original part as it looks like nothing I have previously seen on these models. Depending on how far back it extends it might be possible to move it forward enough, but if not, then bending up a replacement is the way to go. Mechanism spares for obsolete/discontinued models are almost all from s/h, either as they are or reconditioned, very few new parts at all. So be wary of anything Hornby-Dublo, Wrenn, Triang, Trix, Triang-Hornby, Hornby 'made in the UK', Mainline, Airfix GMR, Lima, Bachmann 'split chassis mechanism', and possibly ViTrains (last report was that the Italian factory could be contacted directly for parts). Those are the main brand names you will find s/h in OO. If the item isn't a good runner complete with all mechanism parts, you are out on your own looking for spares. Both Bachmann and Hornby are now moving on to second generation versions (complete new toolings with no relationship to the earlier versions) of China made models, and I would expect that the superseded first generation models will have little to no prospect of spares support now. The good news being that if well cared for they generally don't need it - I haven't (yet!) seen an online comment "when I asked Hornbach for a spare widget for my class XYZ, they replied not available as this earlier version has been superseded" - but it's only a matter of time. Bigmet wrote: Good clear photo. I believe that's a home made substitute for the original part as it looks like nothing I have previously seen on these models. Depending on how far back it extends it might be possible to move it forward enough, but if not, then bending up a replacement is the way to go. Thanks for the comprehensive reply! I'll be honest, I just have a bit of an addiction for the A4's, always loved the shape since I first saw Mallard on a TV programme when I was about 5. I only ever had Mallard as a child, but since my sons got their track and engines at Christmas I've bought another 4 A4's, and would like to get the complete set. I hadn't actually given a thought to spares availability, just been buying whatever is cheapest but running, off of eBay. I seem to have 4 different types of loco-tender couplings now. Mallard (mine, which was £30 2nd hand in around 1995), and Seagull (eBay purchase, £48 boxed, think there's a date of 1984 on the paperwork, with a Beatties price sticker of £24.95). Both of them are tender driven, have a pin on the tender, and the bar on the loco, on the under side of the bar is a copper (I think) 'V'. Quicksilver, in a Silver Jubilee set, is loco drive, has the same pin on the tender, bar on the loco with a copper 'V' beneath, but also seems to have 2 small prongs that stick up as well. The Bachmann Miles Beevor, in the photos above, loco-driven, but pin on the loco, and a bar on the tender. And lastly, what looks to be a fairly new, DCC ready, Hornby Golden Shuttle, which is also loco-driven, but the tender and loco are permanently attached by a bar, which is bolted on. 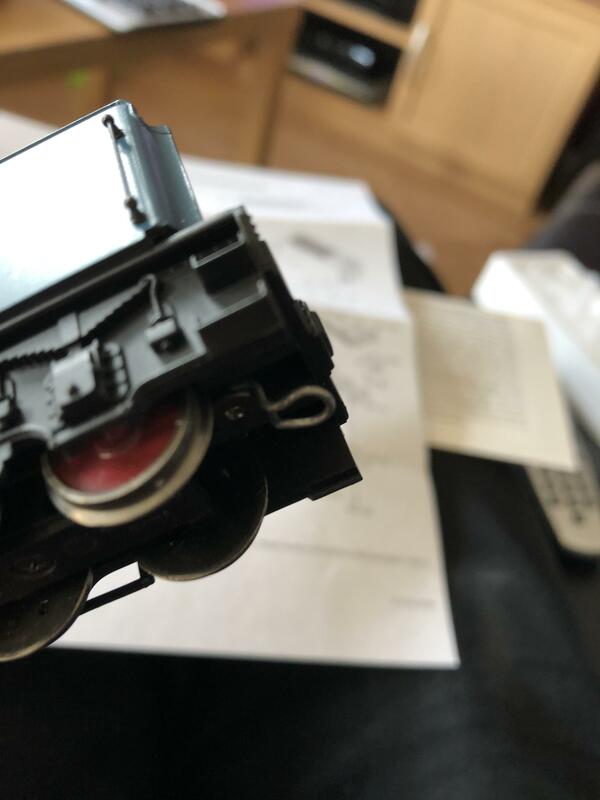 The Hornby loco to tender connector evolved over the years, first only conducting current from one rail, then conducting current from both, thus the additional upward pointing copper prongs. I wish I’d had the chance to hear and see one going like that. The only A4 I’ve ever seen is the union of South Africa, when it stopped in at the Nene Valley railway last september, on its way back down south. My wife took me and the kids for a day out there. Lovely to see, but not the same at 20-25mph. I’ve not seen a new Hornby offering in the flesh, but my son has already decided he wants woodcock for Christmas and birthday. Though at £150+ that’s doubtful. Buelligan, if you think £150 is expensive, don't let your son find out about the Black Label! The Hornby is a bargain. I reckon it is better then either of these more expensive alternatives in terms of external shape. TimberSurf wrote: Buelligan, if you think £150 is expensive, don't let your son find out about the Black Label! Thats ok, he wouldn't want 1 of those, its not green! Oh indeed, I know in model railway terms its not expensive, but as a Birthday or Christmas present for an 8 y/o, its far too expensive. Im trawling ebay at the moment trying to find a cheap green A4 for him. He's already bought himself some teak LNER coaches to use. Trouble is, I keep seeing ones I like and buying those instead. I'm now up to 5 with another 2 on the way. Also getting very tempted by the Hornby live steam sets, though I should probably put up a separate thread about that in the appropriate section. Live steam was a neat idea, but Hornby have now abandoned it, and it is bespoke spares dependent to maintain in operation. None of this would be cheap, but then the stand alone live steam wasn't cheap either. I keep to a strict budget for this hobby, and attractive as live steam was it was competing directly for much the same spend to obtain a first class DCC system and the initial tranche of decoders to begin conversion. Because DCC did much more in terms of operating the entire layout with the many running refinements it delivers, it pretty inevitably got the nod. I would have added a live steam A4 later on, had it been produced DCC compatible, they got the subject choice right for my specific interest. Stop it now, my bank cards taken enough of a beating since Christmas already! I did actually see that earlier, it was a suggested item on another A4 I was looking at. I have to say I'm sure it's very nice, but not worth the £320-350 to what I've been getting, not worth it to me anyway. I've also succumbed to the live steam Hornby, it arrived today. Briefly back on the original topic, I've since purchased another Bachmann A4, experimental blue Woodcock, which is complete, but very jumpy when running, stopping and starting, and only running at all if it's on full power. It's currently hidden from she who doesn't understand the need for more A4's, so might 'borrow' the loco-tender coupling from Woodcock to put on Miles Beevor, and sort out a new coupling for Woodcock if/when I can get it to run nicely. If a Bachmann split chassis A4 (and indeed any of their split chassis steamers) is jerky and needs full power to run at all, then that is usually poor conduction between the axle stubs and axle locations, from a build up of metal oxide and old lubricant which acts as an insulator in the conduction path. Requires the keeper plate to be removed, and a gentle wipe out with IPA, followed by minimal relubrication with a smear of plastics compatible light grease. Labelle and Woodland Scenics are two widely available brands with suitable product.